1 and 1/2 tablespoon "Vlasic" brand sweet Relish. 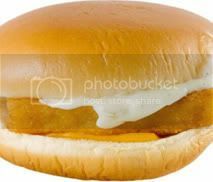 1 Bun, slightly toast inside of both buns in a frying pan.2 fillets of Gorton frozen Southern Fried Fish Fillets, bake them, uncovered (425F) for 18 minutes, turning once after 10 minutes and until coating is golden brown and crunchy. 1 Slice of Cheese (Make sure cheese is room temperature, place a cheese slice on the bottom bun then arrange two, still hot, fillets on it. Let fillets cool to slightly warm and they will get more crunchy as they cool. Spoon on 1 tablespoon prepared sauce. In a large bowl, combine beans, bell peppers, frozen corn, and red onion. In a small bowl, whisk together olive oil, red wine vinegar, lime juice, lemon juice, sugar, salt, garlic, cilantro, cumin, and black pepper. Season to taste with hot sauce and chilli powder. Pour olive oil dressing over vegetables; mix well. Chill thoroughly, and serve cold.